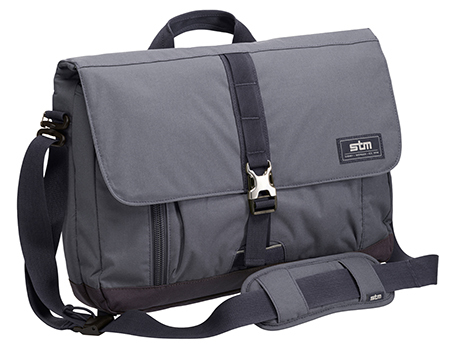 I chose to test and review the STM Sequel Small Laptop Bag suitable for 12” to 14” laptops. A medium version designed for the 14” to 16” laptop is also available. I opted for the graphite coloured one and the Sequel is also offered in a bright red or an olive colour scheme. The Sequel is made from 320D/640D Cottna and lined in 200g Nylex and 200D water resistant poly. What that means is a fairly light canvas type material, thicker on the base, with a water resistant lining and a soft brushed material in the laptop and tablet storage compartments. There is also the typical webbing type strap, handle, luggage passthrough, and fastening strap. It is a good looking and lightweight bag, not flimsy but not heavy duty in feel. Smart enough to be used for work, but not so briefcase-like as to put you off using it everywhere. I have been using the Sequel as my everyday carry-all for three weeks now and my overall impression is positive. The bag isn’t excessively heavy. 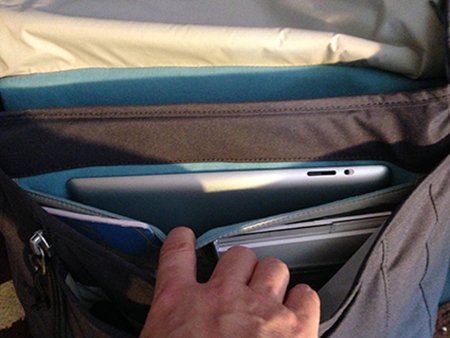 The bottom is padded with the same material as the laptop compartment so you are not at risk of bumping your laptop/tablet if you are a bit incautious placing the bag on to a hard surface. The outer front pocket is not large and has pen holders, plus slip pocket. I put my business card holder, a card reader and a couple of pens in there. It also has a stitched in lanyard with a plastic dog clip. This is a nice touch the lanyard was too short and perhaps should actually have been in the inner pocket. If I attached my keys to it I would have difficulty getting them into the shallow outer pocket. 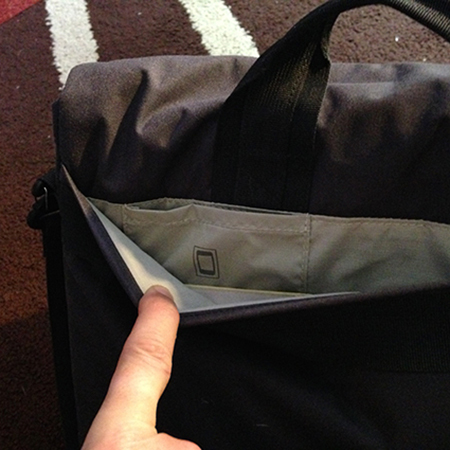 Behind the outer pocket is a zippered quick access (you don’t have to undo the flap to get at it) pocket. Oddly, it isn’t the full width of the front pocket but it is lined with the plush material so it is suitable for more delicate items, as long as you bear in mind whatever goes into it is sandwiched between the outer pocket and the inner pocket. Inner storage pocket is fairly roomy but not a lot of rummage room. 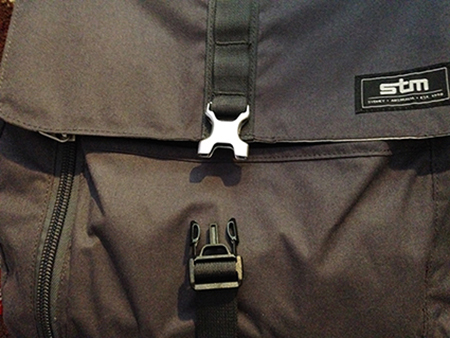 The inner pocket is fairly typical of such bags and designed to carry most of your stuff. It is lined in the water resistant material so I wouldn’t be too afraid to put my drink bottle or perhaps my lunch in there. It has a pair of stitched slip pockets that are able to hold a couple of DVDs in those slim cases. 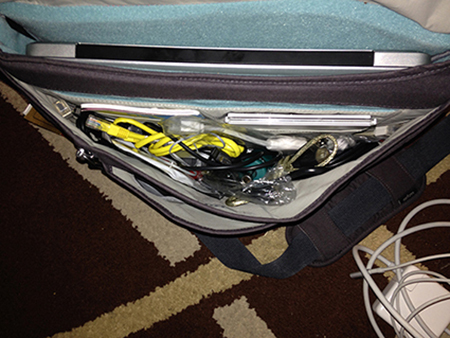 I used it to carry my essential collection of cables, chargers, pocket mice, mini USB drives and similar items. This was fine but I did find that to get at anything but the biggest items I had to basically pull everything out as there isn’t a huge amount of rummage room. Behind this is a plush lined tablet pocket, which was nice, but I would have liked a bit more padding between that and the outer pocket. It is still an excellent idea/addition to the bag. MacBook Pocket with the plush lining. At the rear is the laptop compartment, lined again in the plush material and protected by about half an inch of padding (which feels like some sort of high density foam). This felt snug and I was happy that the padding was sufficient to protect against the typical bump and knock your bag will take in general use. On the rear of the bag is an open slip pocket with a drop in phone compartment. The pocket is good for magazines or the like while traveling but I am not happy to entrust my expensive smartphone to an open and unsecured pouch in such a pocket even for a moment. If I have to put my phone in this bag I opt for inside the bag proper or the quick access zippered pocket. Drop in phone pocket. Not happy to put my phone in here though. I am not much of a train or air traveller so I can’t really comment on the luggage passthrough. Nearly all bags seem to have one but I have no idea if they are actually any use. All I can say is that unlike most bags I have had, this one is a horizontal webbing strap stitched to the back of the bag rather than a full depth, faux outer pocket affair. Removable strap with high quality but plastic fittings. Note the weather gussets at the flap fold. The Sequel closes with a big fold over flap lined with the water resistant material and fastens with a snap fastener with a light but durable brushed aluminium buckle with easy one-handed click-and-go design. Unfortunately the actual catch of the fastener is plastic, and in my experience those type of catches don’t have a great lifespan. I hope that you can obtain replacements from STM but I don’t see any mention on their site of spares or replacement parts. 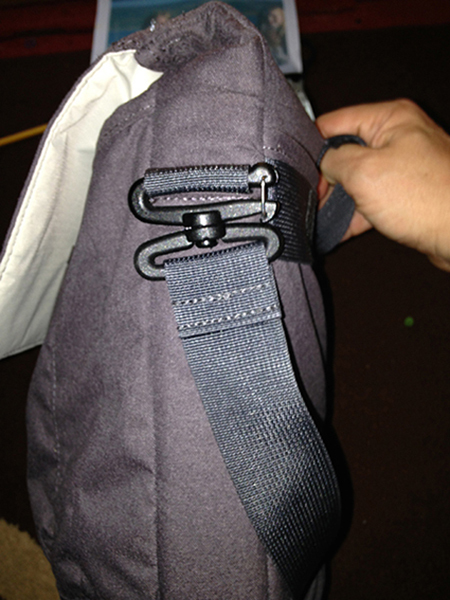 The clip fastener is on an adjustable webbing strap so you can quickly and easily compensate for more or less contents. 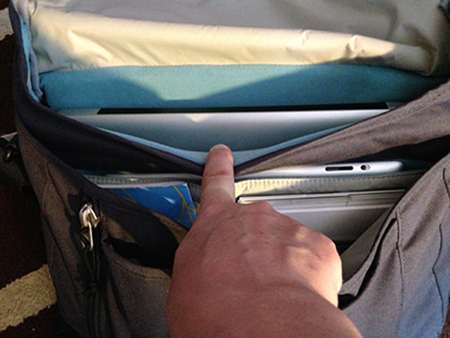 The flap has triangular gussets at the junctions with the laptop pocket that neatly fold themselves in when the flap closes so that the laptop enclosure is not exposed to the elements. There are a set of three pen loops on the flap, to what purpose I am unsure. Aluminium buckle, but plastic catch. The Sequel has an integral webbing carry handle that I found to be comfortable, but it is offset and not on the top of the bag. This is somewhat annoying as it means the bag never hangs vertically and I found it had a tendency to either bang into things, or bang into my legs. This obviously would not be a problem if you prefer to carry the bag using the carry strap which is fitted with a decently sized, non-slip and well cushioned shoulder pad. The strap features a quick release cam clamp so that strap adjustment is quick and easy. The fittings are all plastic with the exception of the aluminium buckle. They seem to be good quality nylon or similar, but even so I would feel happier if I knew definitely I could get replacements easily. I don’t like to use a shoulder strap most of the time and the handle is showing a small amount of tugging on the stitching in the brief time I have been using it. Only long term usage will tell if that is just settling in or could become a problem. The STM promotional material mentions a reflective strip. There is one, but it is so tiny as to be effectively non-existent in my eyes. The Sequel seems like a good courier type bag. It looks smart enough for the office but is casual enough for everyday use. It is light and well appointed. If you want a bag of this type the Sequel is an acceptable choice. (and more if it had more metal fittings).